What are Best Above Ground Pools for the Backyard? My Top Favorite Above Ground Swimming Pools for the Backyard in the Summer! My most favorite summer activity to do when I was a child was ‘going swimming’ in our small backyard above ground pool…. Back then there were very little options and the pools were mostly tiny… but even though we all had a blast together and I just couldn’t wait to get up the next morning and do it all over again! I am a water person and I am lucky to live near the ocean, but I also love swimming pools! I believe one of the best investments you can make for summer time is to get a nice above ground swimming pool for your backyard! Above ground pools are very easy to set-up, very easy to maintain and if you ever have to move from your house you get to take your pool with you! Kids and grown-ups love to enjoy a fun summer day in the water! If you have a large above ground pool you can even invite friends and family and have a blast in the water together! The best above ground swimming pools in my opinion are the ones that are the most sturdy, largest and durable, just like this gorgeous rectangular Intex pool in the picture above! It fits a lot of people playing inside at the same time! Just look at this awesome above ground rectangular pool! I love big swimming pools! Perfect for the whole family to enjoy together! One of the best above ground swimming pools for large families! Will fit all your family together and even some friends! Needless to say the kids go crazy with this huge pool! Don’t you just want to jump in the water? It’s also perfect for fun family gatherings such as barbecues and kids parties! 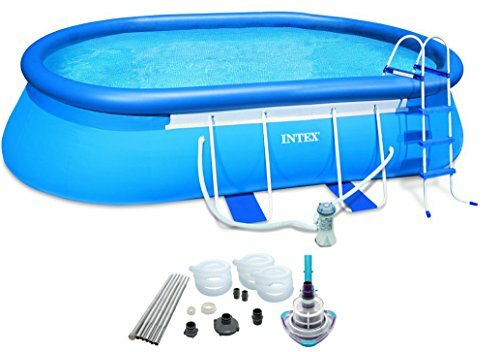 It is a huge Intex rectangular ultra-frame above ground family pool! It is almost like being in a resort in your own backyard! You will need to prepare the place you will put your new pool in advance, making sure the ground is all even and flat. Installation will a take a couple of hours at least. Have some fun in the sun this summer! Great Steel Frame Large Swimming Pool for the Kids! Would you rather have a round swimming pool? 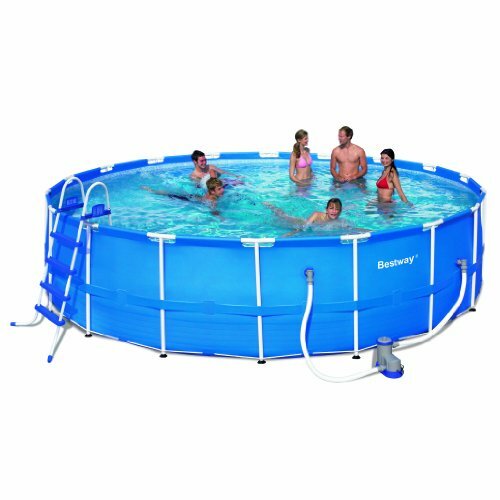 This is a very sturdy, fairly large, awesome round steel frame above ground pool for the summer! 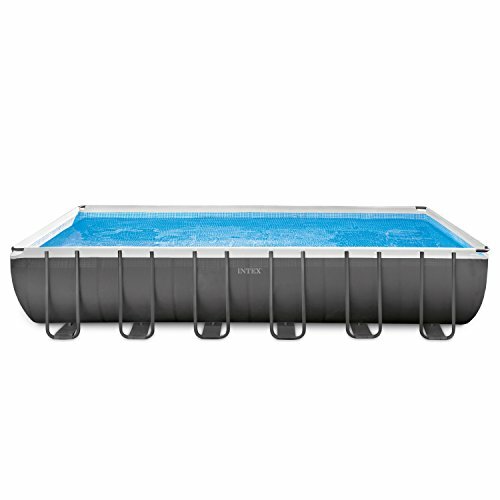 It is made by Intex, which is one of the best metal frame pool makers. It takes approximately two hours to do it. Look how inviting it is!! Bring on the summer, sun, laughter and the good times! Great investment for many years to come! Who needs a water park when you can have your own in your backyard? Also make sure you are setting up your new pool in FLAT ground! Keep it covered at night to prevent leaves, insects or other things from getting inside. Don’t forget to always keep the water fresh and clean. How about getting a huge inflatable oval frame above ground swimming pool for cheap? Except you will be right in your backyard! 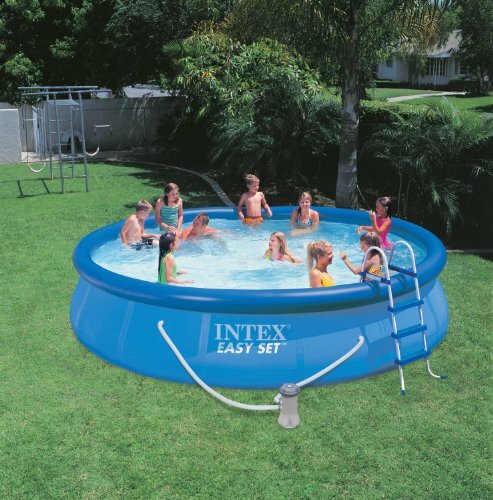 Inflatable above ground pools are usually cheaper than the steel frame ones and much easier to set up! Just inflate the top ring, snap on the steel frame supports and fill it up! The oval shape is perfect for smaller and narrow backyards! It fits a lot of kids playing together! Look at the size of this pool! Fun and easy to set-up above ground oval swimming pool for the whole family! Ready to enjoy in about one hour! The oval shape is also perfect for lap swimming and fun volleyball games! It is perfect for a family of five! Just inflate the top ring and fill it up with water! Ready to use in about 15 minutes! Great to have in smaller backyards just during summer time…. Some buyers have had this pools for many, many years and it’s still perfect! Kids absolutely love this round pool! Mom, dad and children can all enjoy a fun hot summer day in the pool! Perfect for a fun and sunny Sunday afternoon! Great gift idea for the summer! *What is the next best thing to have in your backyard?